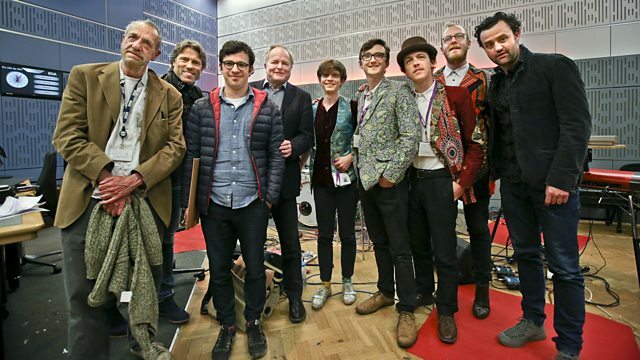 Clive Anderson and Arthur Smith are joined by John Bishop, Simon Bird, Daniel Mays and Dawn O' Porter for an eclectic mix of conversation, music and comedy. With music from António Zambujo and Maia. ‘John Bishop: In Conversation With…’ is on Thursday 20th April at 21.00 on W.
'Fearless' is coming to ITV this summer. John’s ‘Winging It’ tour runs from October to December. Check his website for dates. ‘The Cows’ is published by Harper Collins and is available now. ‘Born To Kill’ starts on Thursday 20th April at 21.00 on Channel 4. All episodes of 'Guerrilla' are available from 13th April on Sky Atlantic and NOW TV. ‘The Philanthropist’ is at Trafalgar Studios, London until Saturday 22nd July. ‘Wild Waters’ is available on 26th May on Vandal. Maia are playing at The Adelphi, Hull on Thursday 20th, Leas Cliff, Folkestone on Saturday 22nd and Phoenix, Exeter on Sunday 23rd April. Check their website for further dates. ‘António Zambujo sings Chico Buarque’ is at Cadogan Hall, London on Friday 21st April, as part of the La Linea Festival. 'Até Pensei que Fosse Minha (I Even Thought She Was Mine)' is available now.